It’s that time again Spartan fans, the start of the college football season. It’s a new year with its own excitements and its own challenges. It’s a sweet smell, right? Well, this first posting will recap last season, breakdown MSU’s 2012 squad and preview the Spartans’ game against Boise State. Last year was a year of many great highs and a few tragic lows. For the second straight year, MSU won 11 games including three wins against teams in the top 16, capped off with a triple OT win against Georgia in the Outback Bowl. The Spartans also claimed the first ever Legends Division title. However, MSU fell short against a very good but beatable teams like Nebraska and a loss in the Big Ten Championship against Wisconsin. While, I won’t debate the merits of the “running into the kicker” penalty (again), the loss prevented MSU from smelling roses in Pasadena. Fast forward seven months, the team lost its a co-starting RB Edwin Baker, MSU’s winningest quarterback, Kirk Cousins and his four primary targets in Keshawn Martin, BJ Cunningham, Keith Nichol and Brian Linthicum. MSU also loses Safety Trenton Robinson and the most aggressive defensive lineman this side of Ndamukong Suh in Jerel Worthy (now playing for the Green Bay Packers). The Spartan Resource Center has expanded again! 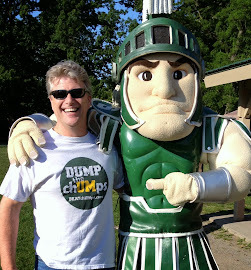 DUMP the chUMps and Spartan Resource now displays, with real time updates, Shaw Lane Spartans Blog most recent posts. SLS has proven to carry good content with a thoughtful delivery. Just visit BEATchUMps.com and go to the bottom on any page. You will find a whole world of Spartans sports headlines, updated real time from dozens of sources - now, including Shaw Lane Spartans. 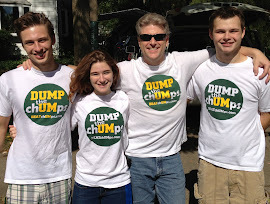 As the season draws near, DUMP the chUMps picks up steam. Daily visitors have increased ten-fold, already ahead of the peak of last football season. Since we have not posted a ton of new material, readers are probably visiting to check the One-Stop Spartan Headlines Resource updated real-time at the bottom of the blog page. 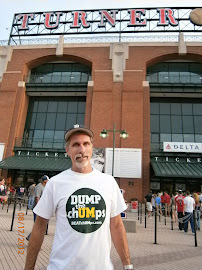 The DUMP phrase and idea about the t-shirts is spreading. One person is on her second order totaling nine shirts now and we have seen reader comments in major media stories use the terms chUMps when referring to our furry friends who play their home games in the Pig House. Thank you all for all the new facebook likes and Twitter followers! It all helps the cause to DUMP the chUMps! 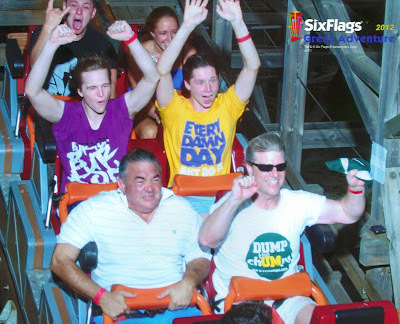 Let's see, if we ran a caption contest for this photo what do you think some contending winners might be? Enter your ideas in the comments section. Former Michigan player: "Nearly half the team was stoned during Appalachian State loss"
In an exclusive interview with a former Michigan player, who came to Michigan as a freshman in 2005, for a story coming later this fall on the transition from Lloyd Carr to Rich Rodriguez, I was told some very disturbing information regarding the 2007 Michigan football team. In a shocking revelation, this former player told me that over half of Michigan’s defensive starters and several key offensive starters partied deep into the night the night before the 2007 Michigan vs. Appalachian State game, then smoked marijuana hours before kickoff in an effort to “see how bad we can beat ‘em up if we are stoned.” The player said that the Michigan secondary and linebackers were the main participants of this group, but the ring leader was an explosive offensive playmaker, who would later be suspended during his Michigan career for failing a drug test. According to this source, the 2007 spring and summer was one big party for the Michigan football team, with very little participation in voluntary off-season workouts, a big change from the prior season when nearly the entire team worked out together and stayed away from the summer party scene. “There was a perception that we were going to be so good in ’07 that everyone kind of thought the entire season was going to be a breeze, we would go undefeated for sure” said the former player. “There were two different teams that off-season it seems. A lot of the Ohio (high school) guys and guys from west coast stuck together, and were really into the party scene, the Michigan (high school) players and seniors were the other group. The really odd thing is that I don’t think Chad (Henne) saw any of the receivers from the time spring ball ended until the first day of fall camp. We were just a bunch of guys with our own agendas and no sense of team. Once (LaMarr) Woodley and (David) Harris left after ’06, all leadership was gone on the team. The entire week leading up to the Appalachian State game was a party, it seems: “Everyone went out Thursday night prior to the game. Like, everyone. I remember some girl asking a few of the players if they were worried about the game Saturday and maybe they shouldn’t be getting so messed up, all the players around her just started laughing hysterically. It was like all my teammates thought we were playing a junior high school team on Saturday. The week following Appalachian State, Michigan was destroyed by Oregon 39-7, giving up 32 straight points after briefly leading 7-3. It pains me to write this article. The source of the story will be revealed in a November piece called “The Transition: Carr to Rich”. For the record, the player refused to name individual players. EAST LANSING — Flash back to 1995, Nick Saban's debut game as Michigan State's head coach and Mark Dantonio's first here as an assistant. It's a harsh loss most Spartan fans, players and coaches have tried to forget since, yet it provides a valuable lesson in where they want to eventually get as a program. The opponent that September afternoon, Nebraska, utterly controlled MSU from start to finish despite losing its starting quarterback, Tommie Frazier, early in the game. The Cornhuskers brought in capable backup quarterback Brooks Berringer, rode running back Lawrence Phillips for much of the afternoon, then subbed in a true freshman named Ahman Green to continue the ground pounding. The final score, 50-10, couldn't even sum up the dominance. Nebraska gained 681 yards, 567 of them on the ground. A few months later, the unbeaten Cornhuskers captured college football's national championship. That's what having depth in a football program means. It can help overcome injuries, it can wear down opponents, it can make competition for playing time bring the best out in backups and starters alike. More on one of the D-lineman, click here. VIDEO: Dantonio Has Turned No-Names to Stars - 2012 Big Hit "Bennie and the Jets"
I have been following a frequent reader comment contributor on M-Live articles related to Spartans sports. He goes by ATownAndDown His posts are well thought out and informative. He has a way of connecting the dots. It's like he has inside info - it's just he has commend of past facts. Developing the MSU receiver corps, to me is the most compelling story of fall camp so I'll be sharing stories with you here. This one, I'll start with an exchange between ATown and the article author, Graham Couch and then the story on Bennie Fowler. God I hope this guy can stay healthy. I had to double check this spring to make sure he wasn't a senior. Despite being injured he just seemed to assert himself as a leader the entire time. He and Norman seemed to take the same role but Norman is a senior. If he can stay healthy and combine that leadership with his talent, the sky is the limit. Look at what BJ did last year and his knock was he didn't have enough speed. So what could he have done if he had enough speed. I think we might be able to find out with Fowler. Its all about health. That foot has to hold up. In some ways, though to a lesser degree in terms of injury, Fowler reminds me of a wideout I covered the last six seasons at WMU, Jordan White. White struggled with knee injuries for four years and then had two brilliant seasons, breaking every school record and catching a 140 passes for nearly 2,000 yards as a senior. Whether Fowler ever becomes that caliber of player remains to be seen, but they're of similar build and mindset. But Fowler needs a healthy season. I know he said he doesn't think about his foot. That's difficult to believe. You are right that it is difficult to believe. He hasn't really had to push the foot for a long period of time or had enough time forget about it. I am a runner and about ten years ago I sprained my ankle. It seemed like I felt twinges or thought it was swollen for months after it healed. I was paranoid that I would aggravate it and be laid up again. Now I understand that my running and ankle don't compare to Fowler and his foot but I think the mentality is the same. Fowler does not want to miss another game let alone an extended period of time because of that foot. And I would guarantee that the first time he goes to break and gets that foot tangled with the DB, he is going to have a moment of panic. I hope that Fowler comes out and is able to finish out his career like White did. I don't know if I would expect those kinds of numbers but to just be healthy and productive. Once he gets going and has really had an opportunity to test out the foot and push it, that is when he will start to forget about it. View full sizeJosh Slagter | MLive.comMichigan State junior wide receiver Bennie Fowler is considered the likely go-to receiver this season for the Spartans, despite just 16 career catches. EAST LANSING — Bennie Fowler has heard the rumblings from folks who believe he didn't actually play in Michigan State's spring game, that instead, a teammate checked in wearing his number. 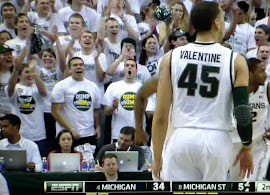 It didn't help that afterward, coach Mark Dantonio didn't remember seeing the junior wideout play in the game. "Yeah, that was me," Fowler insisted this week. "Some people were wondering if that was me. But yeah, that was me." As to why he tapped his position coach, Terrence Samuel, on the shoulder and asked to play — less than four months after postseason surgery in which screws were inserted into his broken left foot — Fowler says it was an important moment in asserting himself as a willing leader and playmaker among a receiving corps short on players proven on either front. "I just wanted to show the coaches that I'm ready, that I don't want to shy away, that I'm not scared of playing in the limelight," Fowler said. "I wanted to show the coaches that I'm ready to go and do big things." That's exactly what Fowler intends to do this season, his foot now completely healed after feeling around "80 percent" during the spring. "I'm not thinking about the foot at all right now," Fowler said this week. "I'm 100 percent. I got my last X-rays in June, showed that I'm a 100 percent healed and I'm ready to go." His coaches and teammates are believers, despite his modest 16 career catches and history with that foot. No wideout has been raved about more to this point this summer than the 6-foot-1, 218-pound fourth-year player out of Bloomfield. "He's finally healthy, he's running as fast as I've ever seen him," said classmate and quarterback Andrew Maxwell, choosing to talk about Fowler when asked if there was one player who stood out to him early in fall camp. "He's leaning down, where he's not small but he's not carrying as much wait, so he's a little faster, a little more explosive, a little shiftier in his moves." "It's a different Bennie," Samuel added. "I had a conversation with him a long time ago. I said, 'You have the intelligence, you have the size and the speed ... and he wants to be a leader. That's why he's asking B.J. (Cunningham) all these questions. He wants to take this No. 1 wide receiver thing to being a leader, as well. "And if he does that, he could be as good as anybody. He's got the skill set." Fowler's constant quizzing of Cunningham, Michigan State's leading receiver last year (and in program history) comes out of an understanding of circumstance. Fowler may only have 16 catches, but that's a dozen more than any other Michigan State receiver has as a Spartan (DeAnthony Arnett's 24 last season were at Tennessee). Josh Slagter | MLive.comMichigan State wide receiver Bennie Fowler warms up before practice Monday. Fowler talks to former teammate B.J. Cunningham on a regular basis about what it takes to be a No. 1 wideout. "(Cunningham is) somebody I talk to every other day — how did he approach his senior season?" Fowler said. "Because I'm looking at this as approaching my senior season, because I have to be the leader for this group. "What I've learned from B.J. is you've got to be there when the quarterback needs you, no matter what — third down, you've always got to be able to make that big play. That starts here in practice every day, getting a rapport with Maxwell and the other receivers and just being that leader for the team." That rapport with Maxwell, by all accounts, already exists, a product of years together, first on the scout team, then the second unit and now as Michigan State's likely go-to connection. "He knows what I'm thinking and I know what he's thinking," Fowler said. "I think we're going to make big, explosive plays," Fowler continued, speaking about the Spartans' unproven passing attack. "We're just going to have to prove it to the defenses Aug. 31 vs. Boise. We go against one of the best defenses in the country every single day. We're going to be prepared. "I've been waiting for this a long time." VIDEO: National Championships. 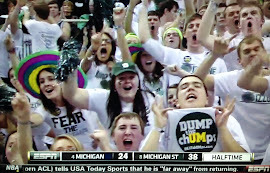 Spartans, chUMps and Champs - Relevant or Irrelevant? I thought it was fun to watch these highlights of the Spartans back to back National Championship seasons in a relevant football era. It caused me to think of what I would do if I were a chUMp and wanted to watch highlights of all those famed football games that were more like games between a couple of frat houses (they sure do make chUMps feel good though). Much of the chUMps glory days were before the invention of TV or the face mask - maybe even the forward pass or the zipper. After watching this video of actual football, you will understand one of many reasons why Boo scUMbuckler's predecessors did everything they could to keep MSU out of the Big Ten. This action was well before he became famous for firing hall of fame broadcaster Ernie Harwell from the Detroit Tigers - a move for which he is fondly remembered - well not really, the chUMp media machine has given Michiganders amnesia about that one. While these highlights came from the 1965 and 1966 seasons, the chUMps most recent back to back NCs came in 1947 and 1948. The thing is, the AP did not select NCs until 1948. There always some quirk with them isn't there? Before that, the chUMps "claim" NCs in 1901, 02, 03, 04, 18, 23, 32, 33 based on a hodge-podge of various organizations that "awarded" national championships, much like all the individual awards handed out at the end of each year today. Other teams also "claim" national championships in those same years. My point here is only that these glory days that chUMps always point to, tirelessly, everyday that I read comments on the web are interesting and historical, but not really relevant in a current football discussion. They point to these irrelevant "victories" while trying to explain why the Spartans are not "relevant" today (and they toss in that MSU was never and never will be relevant). Readers buy in like sheep as if it is fact and blindly run off the cliff with the weasels. I tried to find the video highlights of the amazing 1901-1904 chUMps run and it just wasn't available, although I'm sure someone took the video from the dorm window as the teams played in the open space in the court yard on campus (all games, for the most part were required to be played in Ann Arbor). Let's break down that meat grinder of a schedule in 1904 with 8 of 10 games played at home (chUMps haven't changed much have they?) That College of Physicians and Surgeons game must have a real doozy. Better not look past Ohio State with that American Medical School game on the horizon! *Non-conference game. Homecoming. All times are in Eastern Time. The one game they played? The Toronto Lacrosse Club. They count all these stupid games in the famed "Most wins in college football history" and "best winning percentage in college football". And the National Sports Media carry their water and regurgitate it. Gimme a break dudes! This is why we call you chUMps! That was an unforgettable win against the Peninsular Cricket Club in 1885! On second thought, lets not waste any more time on irrelevant football and instead, stick with real football played with real equipment, with real schedules, in real stadiums and broadcast on real radio, TV and recorded on actual video. Go Green.